At an EGM on 12 December 2015, the Preservation Society decided to progress the purchase of Krauss steam locomotive no. 8457. Members voted in person and by postal vote with the following votes cast: For: 644 Abstain: 4 Against: 5 This represents votes from over 40% of the membership. 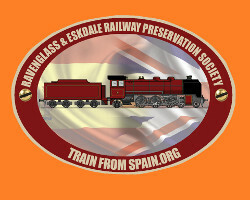 Further details about fundraising, donations and the move of the locomotive from Spain to the UK will be provided shortly. Background to the locomotive is available here. An opportunity has arisen for the R&ER Preservation Society to purchase a historic 15” gauge steam locomotive, Krauss Pacific No. 8457, currently in Spain. This is a significant decision which will use the majority of the Society’s cash reserves, therefore an Extraordinary General Meeting has been called for 12th December 2015 at 1pm in the Village Hall, Ravenglass, to allow the Society’s members to contribute to the decision. Members have been sent a notice of the EGM by post. Members may view background reports and the EGM notice.